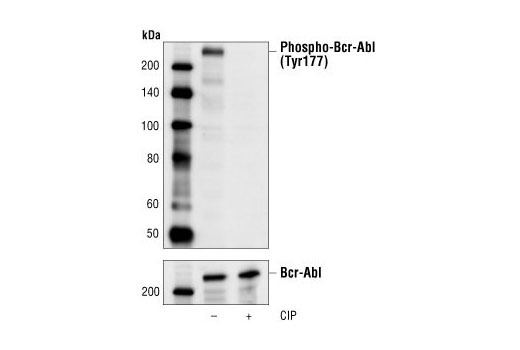 Western blot analysis of extracts from K562 cells, untreated or calf intestinal phosphatase (CIP)-treated, using Phospho-Bcr (Tyr177) Antibody (upper) or Bcr Antibody #3902 (lower). Western blot analysis of extracts from PAE/CKR cells (expressing chimeric receptors of the extracellular domain of CSF-1R, and transmembrane and cytoplasmic domains of KDR) stimulated with CSF-1 (40 ng/ml for 5 minutes) or NIH/3T3 cells stimulated with PDGF (40 ng/ml for 2 minutes) using Phospho-Bcr (Tyr177) Antibody (upper) or Bcr Antibody #3902 (lower). 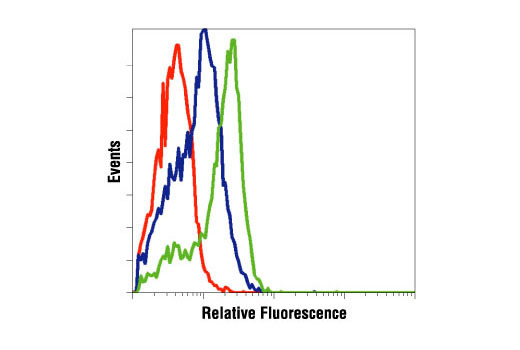 Flow cytometric analysis of K562 cells, untreated (green) or Gleevec® (STI571)- treated (blue), using Phospho-Bcr (Tyr177) Antibody compared to a nonspecific negative control antibody (red). 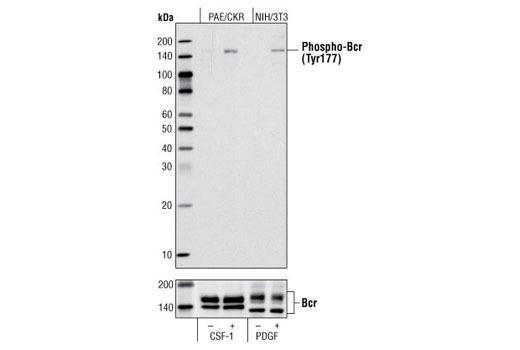 Phospho-Bcr (Tyr177) Antibody detects endogenous levels of Bcr and Bcr-Abl only when phosphorylated at tyrosine 177. Polyclonal antibodies are produced by immunizing animals with a synthetic phosphopeptide corresponding to residues surrounding Tyr177 of human Bcr. Antibodies are purified by protein A and peptide affinity chromatography. The Bcr gene was orginally identified by its presence in the chimeric Bcr-Abl oncogene (1). The amino-terminal region of Bcr contains an oligomerization domain, a serine/threonine kinase domain, and a region that binds SH2 domains. The middle of the protein has a PH domain and a region of sequence similarity to the guanine nucleotide exchange factors for the Rho family of GTP binding proteins. The carboxy-terminal region may be involved in a GTPase activating function for the small GTP-binding protein Rac (2,3). The function of wild type Bcr in cells remains unclear. PDGF receptor may use Bcr as a downstream signaling mediator (4). Research studies have shown that the Bcr-Abl fusion results in production of a constitutively active tyrosine kinase, which causes chronic myelogenous leukemia (CML) (5). Tyr177 of Bcr is phosphorylated in the Bcr-Abl fusion protein, which plays an important role in transforming the activity of Bcr-Abl (6). Phosphorylated Tyr177 provides a docking site for Gab2 and GRB2 (7,8). Groffen, J. et al. (1984) Cell 36, 93-99. Maru, Y. et al. (1991) Cell 67, 459-468. Che, W. et al. (2001) Circulation 104, 1399-1406. Abe, J. I. et al. (2001) Ann. N.Y. Acad. Sci. 947, 341-343. Voncken, J. W. et al. (1995) Cell 80, 719-728. He, Y. et al. (2002) Blood 99, 2957-2968. Sattler, M. et al. (2002) Cancer Cell 1, 479-492. Warmuth, M. et al. (1995) J. Biol. Chem. 272, 33260-33270.